A history of the Kirk in the Canongate by Ronald Selby Wright. The church was founded in 1688 and completed in 1691. The master mason in charge was James Smith. A plaque on the front of the church bears witness to it having been built through a large bequest from a local merchant. Previously the residents of the Canongate had used the Abbey Church adjacent to the Palace of Holyroodhouse, but King James VII ordered the construction of the new Kirk of the Canongate, allowing the Abbey Church to be converted into a Chapel for the Order of the Thistle. (The current Thistle Chapel is attached to St Giles’ Cathedral ). Architecturally, the Kirk has a Dutch-style end gable and a curious, small doric-columned portico over the entrance. Although outwardly rectangular, the Kirk’s interior has a cruciform layout (highly unusual for a post-Reformation, pre-Victorian Church of Scotland building). The Kirk’s interior was extensively remodelled in 1882, with the inclusion of a pipe organ and a central pulpit. These unsympathetic alterations were removed in the early 1950s, along with the galleries. The resulting reordering considerably increased the levels of light; the original dignified simplicity of the Kirk was able to be appreciated once more. The Kirk was further restored in 1991 by the Stewart Todd partnership, followed by the installation of a new Danish-built Frobenius pipe organ in 1998, in memory of the late Very Rev Dr Ronald Selby Wright. This was the 1000th organ to be built by the Frobenius company. Following the Disruption of 1843, a Holyrood Free Church congregation was formed. A church was built in front of the Palace of Holyroodhouse, but the building was closed in 1915 (when that congregation united with Abbeyhill United Free Church, becoming Holyrood Abbey Church, located in London Road.) The former Holyrood Free Church building was reopened as The Queen’s Gallery in 2003, to house exhibitions from the Royal Collection. The Canongate kirkyard is the resting place of several Edinburgh notables including the economist Adam Smith, the philosopher and Smith’s biographer Dugald Stewart, Agnes Maclehose (the “Clarinda” of Robert Burns), David Rizzio, the murdered private secretary of Mary, Queen of Scots, and the poet Robert Fergusson, whose statue in bronze by David Annand stands outside the kirk gate. Bishop James Ramsay is also buried here. The Kirk has an active congregation, conducting two worship services each Sunday. The building is also regularly used for concerts. 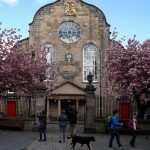 During the annual Edinburgh Festival, the Kirk is extensively used as a venue for music, as is the Kirk’s nearby hall – the “Harry Younger Hall” (which is known as “Venue 13” for the duration of the annual Edinburgh Festival Fringe; Venue 13 is run by the Royal Welsh College of Music). 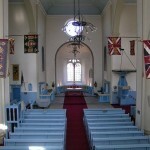 The Kirk was previously the regimental chapel of The Royal Scots Regiment of the British Army and is now the regimental chapel of The Royal Regiment of Scotland. Canongate Kirk has been served by several well-known former ministers, two having also served as Moderator of the General Assembly of the Church of Scotland. Thomas Wilkie was twice Moderator – in 1701 and 1704. The Very Reverend Dr Ronald Selby Wright, known as the “Radio Padre” for his famous wartime broadcasts, was minister from 1937 until 1977 and served as Moderator in 1972. Whilst Dr Selby Wright was away on wartime service as an Army Chaplain, the Revd George MacLeod (later the Very Revd Lord MacLeod of Fuinary, founder of the Iona Community and Moderator in 1957) served as locum. Dr Selby Wright was succeeded as minister by the Reverend Charles Robertson LVO MA, who retired in 2005. The current minister (since 22 June 2006) is the Reverend Neil N. Gardner MA BD (who was previously minister at Alyth and an Army Chaplain in the Black Watch Regiment).